antone have an idea of what weight oil to use in a long 2 cyd diesel and six speed transmisson, use a model 310 as an example. 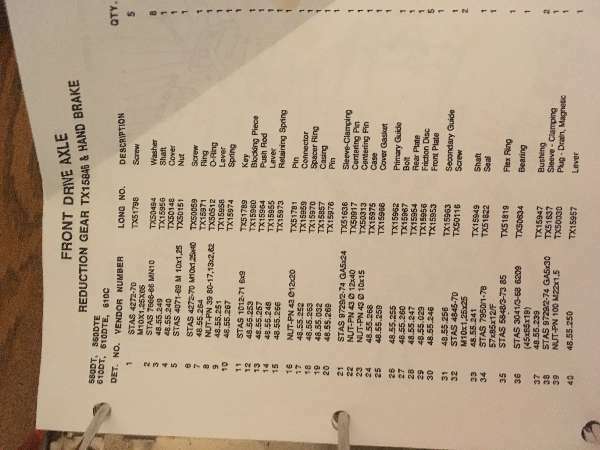 Thanks for any reply Fred, Tenn.
Any 15W40 is acceptable for the engine, I've always been partial to Shell Rotella T. Best I can make out from TractorData Fred, is that the Long 310 is a common sump tractor. So any UTF (universal tractor fluid) is acceptable as well. They're pretty much all 30W equivalents, you can even get it at WalMart. thanks for the info, any idea of the engne ol capacity? Don't know specifically. But generally that size engine takes 4-6 quarts (not including filter). Unless you're working in a heated space, you should get the new oil up to room temperature. After draining the oil oil and installing a new filter, I'd put in 4 quarts and start it again. That pumps oil into the filter housing. Shut it down after a minute, then wait 10 more to check the dipstick. Top up as necessary. You mentioned common sump system, is the transmission and hydraulics using the same oil? http://http://www.tractordata.com/farm-tractors/005/8/1/5810-long-310.html Is a web site with general information on your tractor. If you will get hold of them when you do have values and I think they would appreciate a photo. http://www.jensales.com/Long-310-Tractor-Data_p_84509.html this site has your operator manual, typically the op man has the info you are requesting. Both sites are pretty good for general info on all tractors, the last you can also get manuals from if yours are no longer available, or as I have done with some, look on EBay. I could provide general information on what I would do, but, I would also have purchased a manual for it. Guessing is a not so good of way. Bad guess could hurt your tractor. Yes. And the fact that it has to work the hydraulics is why it's a 30W equivalent. On a dual sump tractor, tractor hydraulics use anywhere between AW5 to AW100 (5W to 30W), depending upon ambient temperature. Similarly, dual sump tractor gear oil can vary anywhere between 75W and 140W. Hi, newbie here. I have a Long 460, my first tractor. Have experience in shade tree mechanics for car and motorcycle, so I figure I could tackle an old tractor. Anyway, my manual says 15W-40 for engine oil. Oil capacity with filter is 7L. I have a hydraulic question, but I'll search the forum first. Unless the oil is diesel rated (all 15/40 ones that I've seen are, though I have no idea why) you should change it more often than the manual says.